It's almost a given that a 200-kilometer ride is going to be "epic," and yesterday's group of 34 intrepid riders was certainly treated to another epic ride. Where heat of 100 degrees or higher has been a problem on this ride so many times in the past, this year instead we had a chilly, cold wind that kept our lunchtime temperature just in the lower 50s ... with a 20 mph wind on top of it. And a few riders finished their day in Mountain View with a brief but surprisingly strong rain shower that opened up over the city during the 6 p.m. hour. The weather was just one of the factors that contributed to a day of many lessons learned. First on the list came even before the ride began: the importance of rest. Our shockingly early 5 a.m. meet time was just like you'll have on Day 1 of the ride, which means waking up significantly earlier. And almost every day of the ride, you'll be up and going by 5 a.m. in order to be ready for the 6:30 a.m. (on most days) ride-out. The night before a big event such as this certainly can increase one's anxiety, and the adrenaline of completing each day of the ride will keep you going during evenings in camp, but getting sufficient sleep is one of the most important things that you need to do during ride week. There's a 9:30 p.m. quiet time in camp, and everyone should show proper consideration for those trying to get some shuteye. Mornings in camp start early, with many tents beginning to stir around 4:30 a.m. (even earlier in some roadie sections ... all those dining-tent workers have to be awake long before the rest of us). With seven days of non-stop riding, it's also vitally important that you remember the lesson, given several times here already, that you pace yourself. Yesterday's ride began with 30 easy, flat miles, and it was quite tempting to ride near 100% of your ability. The risk is that, by doing so, you end up paying for it later in the day with a greatly reduced pace ... or, in some cases, not even being able to complete the entire day. Consider the math: You could ride half the day at 15 mph and half at 11 mph, or you could do the whole day at a much less stressful 13 mph and still finish at about the same time. Listening to your body is also important. If you ended your ride early because of physical issues, then there is no doubt whatsoever that you made the right choice. No ride is more important than your long-term health, either during training season or on the event. On a very long or multi-day ride, it can sometimes be tough to distinguish between the normal stress that you experience and stress that can be potentially harmful, so don't be afraid to listen to the sage advice of others. And if you're unsure, then always err on the site of caution. The same can be said for being aware of mental issues, since they can affect your ability to ride safely. Here's my case in point from yesterday. 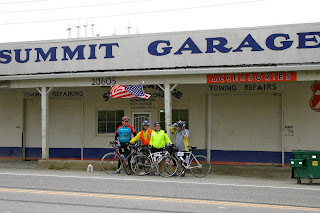 As we rode back from Livermore to Pleasanton (into that wind! ), my mind started to go into bad places, aided no doubt in part by my legs that were aching from not nearly enough riding in the past two weeks. One of the messages drilled into us at ride leader school is that the rides are always about you and never about me. Well, as my miles slowly ticked past 70, I was sinking too far into me, me, me -- which left me unable to carry out my ride leader duties and help the rest of you. So, when I reached Rest Stop 4, I accepted the offer of a ride in a SAG vehicle to the next rest stop. With that break, I was able to resume riding in Hayward and complete the rest of the day ... and the break gave me time to stop being wrapped up in myself. As you ride on the event in June, it's way too easy for your mind to wander off focus and land in places that are either happy or not so happy. Either way, this creates a safety hazard not just for you but also for the riders around you. The ride requires concentration and focus at all times, especially with more than 2,500 other riders on the road; save the meditation and rumination for rest stops, camp, and after the event. But let's get back to more positive thoughts! You've just completed what is essentially a randonneuring event, which takes you into an even more rarefied stratum of cycling. If you wish, a whole new world of events and community has opened for you. One of the largest such groups is Randonneurs USA, which produces events across the country. Locally, RUSA-affiliated groups are in San Francisco and Santa Cruz; in fact, the Santa Cruz group is in the middle of a 600-kilometer event (in this weather, eeek) as I write this. The current president of RUSA is based in Santa Cruz and just happens to be an ALCer as well. 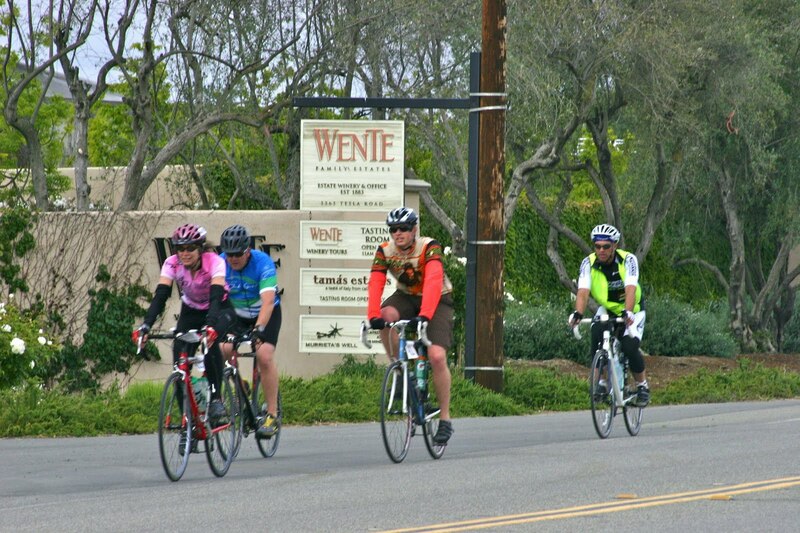 The style of most randonneuring events is very similar to what we've experienced on our training rides: route sheets but no route markings, rest stops at stores and restaurants, and similar time limits. Even if you never progress beyond the 200-kilometer level in randonneuring, there's still a wide variety of rides and routes available. What's next? That's it for the Mountain View training rides for this season. 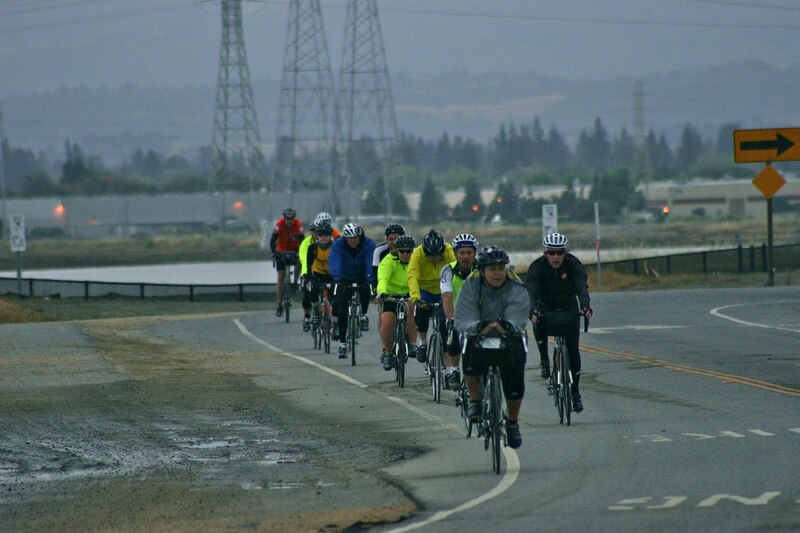 But many of you also ride the Sunday rides out of Sunnyvale, and that group is running a 41-mile celebration ride next Sunday two weeks from today ... and all Mountain View riders are invited to participate. Details and RSVP are here. And if ALC10 isn't enough for you, two other events to benefit the San Francisco AIDS Foundation are coming up this fall. 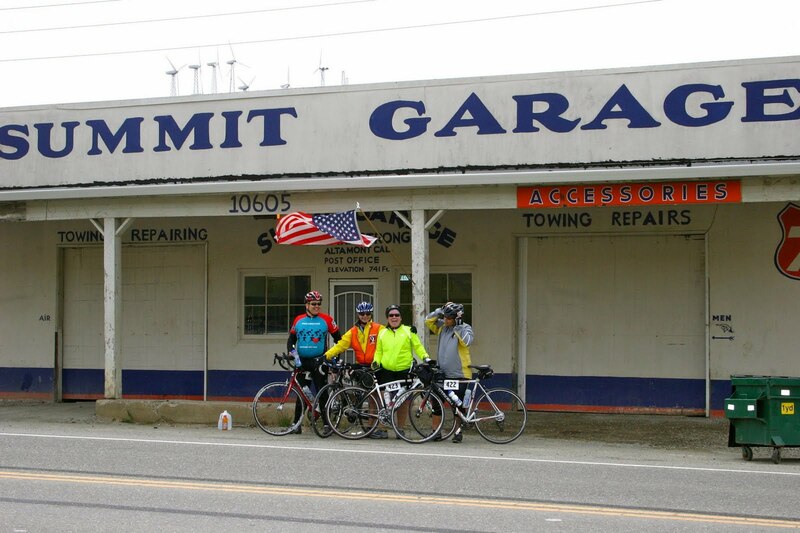 Now in its fourth year, Seismic Challenge is changing format this year to a one-day, 100-mile ride on Sunday, Oct. 2, down the coast from Fort Bragg to Guerneville. The day before, riders will be transported from San Francisco to Willits for a ride on the historic Skunk Train. The event is limited to 300 riders and has a $600 fundraising minimum. Ride one event, or ride both! In these challenging economic times, the San Francisco AIDS Foundation needs our help more than ever. 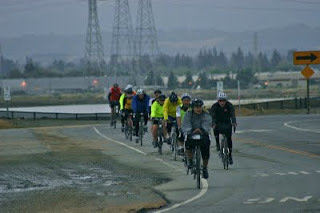 I plan to lead training rides out of Mountain View again beginning around mid-July to help riders get ready for both rides; watch ridewithchris.org for details. As many of you have heard by now, I'm not riding in ALC10. It was a bittersweet decision for me, and I'll admit to more than a few feelings of sadness as the event approaches. But it was a choice I had to make for a number of reasons that were about me and not about the ride. I still plan to show up somewhere during the week, perhaps even more than once, so don't be surprised to see me traipsing around camp or perhaps even on the road. This concludes our Distance Training rides for 2011. I'd like to thank the numerous ride leaders and support drivers who were part of our team and who helped keep you safe, fed, and hydrated ... and even serenaded with music at more than a few locations. Even though I'm usually the public face of these rides, I couldn't do it without the tireless help of these amazing volunteers. But most of all, of course, thank you for riding. Whatever your reasons for riding, you're making a bold statement, and you're providing visibility, awareness, and funds. I've been honored to make many new friends on these rides, and I've been especially touched by the community that's spontaneously formed. The AIDS/LifeCycle community continues year-round, and it's a community where I know I can find a source of strength and affirmation. We focus on one week in June, but the other 51 weeks are part of the magic, too. 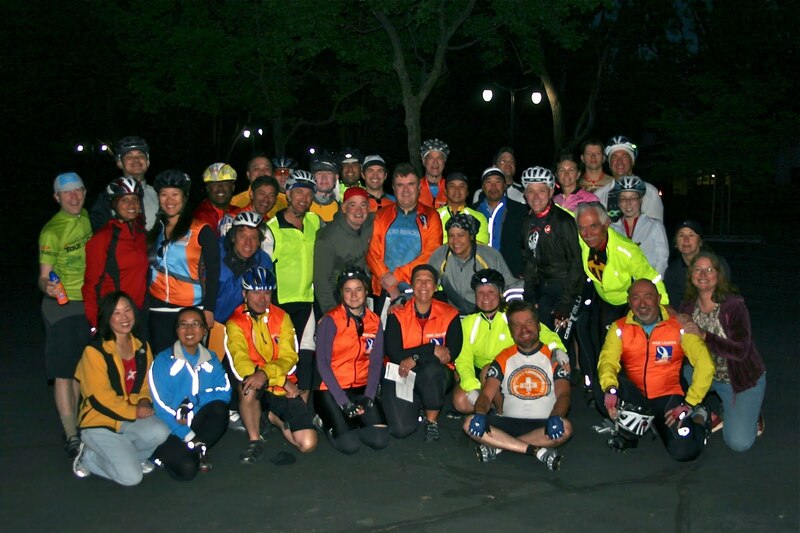 Have a safe and successful ride in June, and thank you for being part of AIDS/LifeCycle.